No matter how wide your leg, we make these boots to fit you! Choose Pointed, medium round or square toe. Just tell us how wide your leg is. Rugged, comfortable the tradional leather when you want handmade boots that will take the worst weather and still look great. 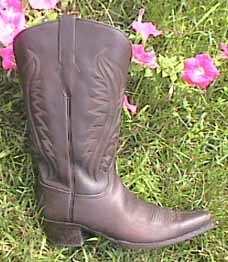 Shown in dark brown, also available in black. Matching His and Hers available.